Flood-study surveying involves rafting wild rapids and perching on rocks to get the job done. 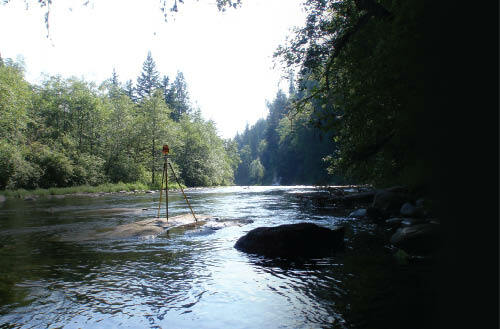 As part of on-going flood studies, the Seattle district of the United States Army Corps of Engineers last July required surveys to collect the thalweg, cross-sections, and crossings, such as bridges and pipelines, along a 23-mile segment of Washington State’s Green River in the western foothills of the Cascade Mountains. 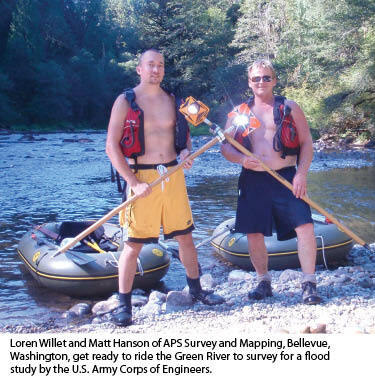 The Corps selected my firm, APS Survey and Mapping of Bellevue, Washington, to perform the work that set the stage for a summer of surveying that was at once exhilarating, exhausting, and professionally satisfying. The project’s lower end at river mile 37 is only eight miles east of downtown Auburn, Washington, and meanders through woods and pastures. When you’re traveling upstream, however, the remoteness increases with each river mile. The largest portion of the survey passes through the Green River Gorge, referred to as Eagle Gorge by the early railroaders. This is an isolated section of river with cliffs rising in excess of 300 feet from a 70-foot-wide riverbed. 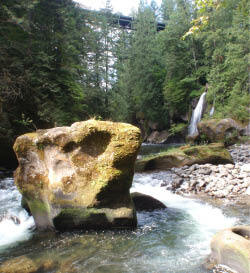 Caves and spectacular shapes have been carved in the rock walls by the raging water. Sixty-foot flat rocks that long ago fell to the riverbed have been worn smooth with strange, round holes puncturing the surface of their rocky planes. 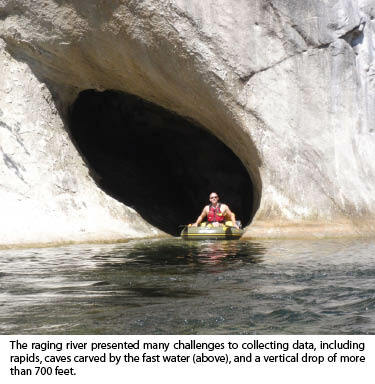 With a vertical drop of more than 700 feet, there are more than two-dozen named, Class III, and Class IV white-water rapids within the 23.3 miles of river covered in the survey. APS’s survey also includes segments through Flaming Geyser State Park, Nolte State Park, and Kanaskat-Palmer State Park: all home to elk, deer, bears, cougars, and coyotes. The river is flooded with migrating salmon during a portion of the year, and our crews regularly encountered river otters as well. The Green River’s flow is carefully regulated by the Corps of Engineers that operates Howard A. Hanson Dam four miles upstream from the survey terminus at the Palmer Stream Gaging Station. A fraction of the water from the dam is piped from the pristine upper watershed for the city of Tacoma’s drinking water, and the Corps manages the water level of the dam to ensure a constant flow for Tacoma in case of low rain and snow melt. Of course, the principal purpose of the dam is flood control, so adequate capacity must be reserved to accommodate unexpectedly heavy rain or snow-melt runoff. This balancing act is an art, especially with the Northwest’s weather extremes. However artful the control, this irregular water flow was a constant concern for our surveyors and our project requirements. The range of discharge varied from a low of 135 cubic feet per second (cfs) to 850 cfs during the course of our survey. A flow of 850 cfs in the narrow gorge may be minimal for kayakers but is clearly disruptive and unsafe when we’re trying to take precise measurements along the riverbed. Two days after completing the final section of the river, a flow of ±3000 cfs was released from the dam that would have been challenging for even the most experienced river runners and would have made accurate surveys impossible. 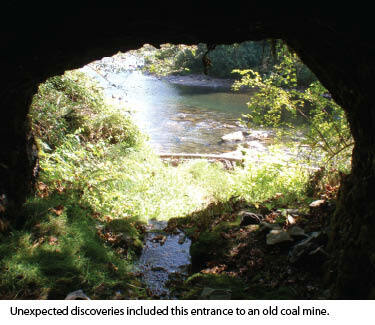 We began our work by reconning access and extraction sites. We knew this survey was going to require inflatable boats and a significant amount of equipment. This limited our entry to about six points from the Kanaskat-Palmer State Park down to Flaming Geyser State Park. These entry/extraction sites were also paramount in our overall safety plan. Cell phone service down in the gorge floor was at best intermittent and for one five-mile stretch nonexistent. Five miles through rapids with an injured person could be life threatening, so we added an emergency radio to our standard river gear. As part of our safety plan, APS turned to River Recreation, a 25-year-old river guiding company with a stellar track record, for training and support. They tailored a course and their staff also helped us select wet suits, dry suits, helmets, and other safety gear. We also had Big Sky Inflatables, of Missoula, Montana, build us two of their Grizzly Rafts. We found them to be extremely rugged, safe, and easy to maneuver. Even with the training and safety gear, we elected to have the River Recreation guides accompany our team during the most technical portions of the river. We wanted to set pairs of intervisible control points at intervals of approximately 1,500-foot or in spots that provided us with expansive vistas of the river. On one such spot near river mile 52.1, a 25-foot high rock protruded into the river. It was set on a 100-foot by 25-foot water-smoothed flat ledge covered with knee-deep water. But along the edges and in the middle of the flat rock, the river had etched nearly perfectly round 12-foot deep potholes. On the outer edge, the river depth dropped off 18 feet as it approached the steep cliffs on the other side. The value of the 25-foot high rock for our survey was immediately understandable as it gave us great visibility upstream and downstream. Our initial question was how to get to the top with the GPS and total station gear. Within the gorge are surprises around each bend. It’s hard to believe this lush wilderness is only 30 miles southeast of downtown Seattle. 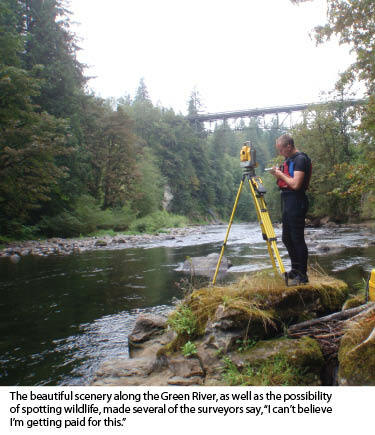 Because of the depth of the gorge and generally taller-than-100-foot trees on the river’s banks, we used Trimble R8s to take advantage of the additional satellites in the GLONASS system. All of the river observations were taken using fast-static (45-minute observation periods) with dual occupancy. Our initial plan was to use RTK with repeaters set at strategic intervals down in the gorge. During the course of our initial search for extraction points, however, we scuttled that plan. We even tried to use phone repeaters to enable us to use the Washington Virtual Reference System, but finally we decided against this approach. Our thinking was that the Trimble R8s are amazingly rugged and dependable. We didn’t want to spend valuable manpower hours on approaches that weren’t a sure thing. Using the fast static approach reduced our equipment requirements, gave us full confidence in the outcome, and was nearly foolproof. Reduction of the GPS data gave us regularly spaced control throughout the project, with relative vertical and horizontal accuracies better than 0.05 feet at one sigma. Though our traverses were run with a one-second Leica TCRP 1201 total station and all angles were doubled (direct and reverse), it was the GPS control network that gave the crew the confidence to proceed to the next thalweg point or cross-section. Our concern with relying solely on traverse was that we could have a bust that would require a costly revisit to the site. Getting in to a single section of the river within the gorge area took three hours, not including the drive to the site from our office. The trip out could be equally time consuming. Fortunately, all the traverses closed. Depending on which section of river we were on, the thalweg shots were taken at <50-foot, <100-foot, and <200-foot intervals. Determining the thalweg was frequently a difficult task. Much of the river is strewn with 3-foot to 10-foot boulders. Changing the location of a shot even by inches can change the elevation by several feet. When the river discharge was low, we would walk or float across the river, picking out the deepest point. When the river was high or muddy from rains, it required constant probing of the riverbed to establish the thalweg. We tried to use fathometers to track the bed, but they lasted only until the first boulder we smashed into. In some of the deeper areas we employed lead lines, but mostly we used a 12-foot metal rod with a 360 prism. In those areas where we had extensive rapids or whitewater, we used our boats with zip lines to hold a position long enough to get the shot. The Leica has amazing tracking ability, but not when the rod is being thrown from side to side and the undulating water is pitching the prism up and down. As with all work on the river, the value of patience, problem solving, and cooperation was driven home. cross-sections to be taken at the beginning and end of each rapid, or every 1500 feet, or at previously surveyed cross-sections or beneath any object crossing the river, such as a bridge or pipeline. The total count was 139 cross-sections, or one every 885 feet, with thalweg points in-between. The crew’s challenge was to hold an eight-foot inflatable raft steady as the rushing water was launching the boat over boulders or over a nine-foot fall. We quickly evolved an approach using multiple zip lines to control the orientation and location of the boat. Perseverance won the day as we collected each section. Just wading across the river was treacherous. One of the park rangers informed us that the felt soles we normally used for walking on slippery rocks were now prohibited. Subsequently, the rubber-soled boots we were forced to use slipped easily on the rounded boulders, which led to a lot of falls. During the project we destroyed or lost a camera, a prism, a sleeping bag, a pair of sunglasses, a wedding ring, radios, and pocket tapes. Additionally, we broke seven oar rings, three oars, a prism rod, three fathometer transducers, one tripod, and a Kevlar prism rod. However, we lost and broke things that we understood from the beginning could be replaced. The crews had definite instructions to protect themselves first, equipment second. With the exception of numerous bruises (especially on the shins from rocks) no one was injured. The last task was to provide as-builts of the pipelines and bridges crossing the river that required a significant amount of coordination between the survey crew and the owners to obtain access. Knowing that all the information was going to be mapped in true 3D, we surveyed each object from top to bottom. Some of the bridges towered 150 feet above the water. When the points and line-work were inserted into the drawing, the elegantly arching trestles fit perfectly. The final mapping, profiles, and cross-sections were generated using AutoDesk Land Desktop 2009. While APS Survey & Mapping does use AutoDesk Civil 3D 2011, when our clients ask for it, we much prefer the older version of Land Desktop. For the middle project along the Green River, we also produced a YouTube video. For the deliverables, we provided the Army Corps of Engineers with AutoCAD dwg files and Microstation dgn files, along with paginating Adobe pdf files showing each cross-section fully annotated with the bed of the river, water level at the time of taking the cross-section, XYZ and Station/Offset for the two control points set near the end of each section, any objects crossing overhead, time and date of survey, and discharge rates. Additionally, the pdf file contains photos looking upstream, across the cross-section, and downstream. APS also provided ASCII files of all 8,000-plus points taken during the survey. Despite overcoming bizarre and record-breaking weather patterns, unexpectedly high discharge rates from Howard A. Hanson Dam, and access difficulties made worse by assertive adjoining land owners, every APS surveyor who worked on the project said: “This was a job of a lifetime” and that they would jump at the opportunity to do another one. Field crew members Loren Willet, Nick Pugh, Jason Goode, Matt Hanson, and Robert Keating and the rest of the APS Survey & Mapping staff join me in expressing our sincere thanks to the Seattle division of the Army Corp of Engineers for selecting us for this work and for providing their full cooperation to help us complete all three phases of the Green River Project on time and on budget. Tyler Sweet is a professional land surveyor in Washington, Oregon, Idaho, and Alaska and is president of APS Survey & Mapping, LLC, a 15-person firm in Bellevue, Washington. He has been surveying since 1969 and has worked extensively in the Pacific Northwest and Alaska. 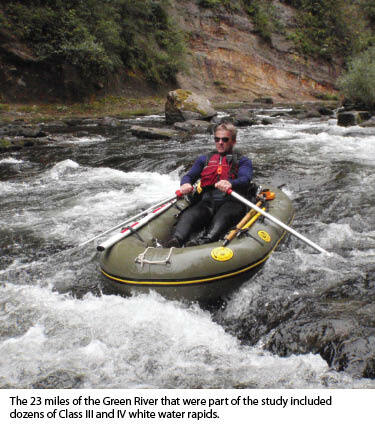 Tyler works in the field every week and took an active part in the Green River survey. *All photos courtesy of APS Survey & Mapping.